I had the great pleasure to drink at the Zig Zag Cafe on not one, but two nights during my vacation to Seattle and environs last week. Thanks first to Drinkboy, Robert Hess, for letting us know we could get an Aviation there. We got a whole lot more! Owners Kacy and Ben, along with Murray Stenson and Eamon, served up wonderful drinks and great conversation. I had my Aviation (wonderful ) followed by a Trident and then Murray suggested a Last Word. For those who love maraschino liqueur, I think this is even better than the Aviation! Murray said he found it in a book. When I tried googling it all I got were some foreign sites. Shake with ice and strain into a cocktail glass. Enjoy! We also had the pleasure of meeting and drinking with Robert Hess and yes, the man really does carry his own supply of bitters around with him. They take their drinks very seriously at Zig Zag and Robert puts them to the test. We also had wonderful Brandy Crustas, Pegu, McKoy, Old Fashioned, tasted several gins, chartreuse, strega and absinthe - served the proper way - flaming and all! The only sad part of the trip was that Murray was off Saturday night, our last night! It's a long ride from NJ to Seattle, but I have to find a reason to do it again soon. I had the great pleasure to drink at the Zig Zag Cafe on not one, but two nights during my vacation to Seattle and environs last week. I had one of these a few weeks back at Zig Zag when Murray was perfecting it, and it is truly unique! I have GOT to try this one. I love Chartreuse (and have a gigantic bottle of it), but have had a hard time working it into cocktails (mostly Audrey's Tantris Sidecar these days). Can you share the Sidecar recipe? I really like those! Just mixed up a Last Word this evening for myself, bergerka and JAZ. Great cocktail. Janet and I were both struck by the way the cocktail evolved in the glass. The first sip was sweet and the maraschino came through very strongly, making us think that it wasn't balanced quite right. But both the sweetness and maraschino had married with the other flavors into something that didn't speak too strongly of any single flavor by the second sip. Indeed, every sip was a little different. Very interesting and enigmatic cocktail, somewhat evocative of the Twentieth Century Cocktail in being hard to nail down. And talk about a cool-looking drink! Great green color. I garnished ours with lime twists. I wondered what would be an appropriate garnish. I thought of the lime or maybe a cherry - it looks naked otherwise. I still have to buy chartreuse and now you have added calvados to my list. The fun just never ends! Question about Audrey's recipe - what does she mean by simple syrup (1-1)? That'd be simple syrup made with equal measures of water and sugar -- e.g. 1 cup sugar and 1 cup water (which will yield maybe 1 1/4 cups syrup, a substantial supply). I'm glad I had a chance to meet up with you while you were in Seattle! And especially glad you had a chance to experience the Zig Zag, and Murray. Sorry he wasn't there on your last night. 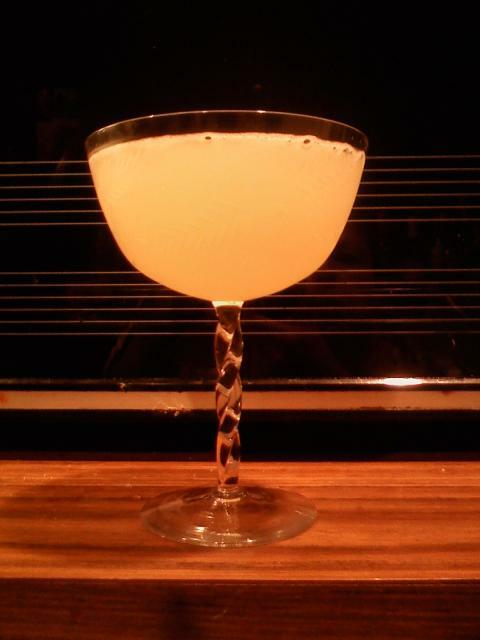 Another Chartreause cocktail that I am really fond of is the "Tailspin"
Stir with ice. Strain into a cocktail glass. Garnish with lemon twist and cherry. It's not one that you see very often, and when you do, they usually list it's recipe as basically the same thing as the Bijou (which uses a dash or orange bitters instead of the Campari), but frankly I think the Campari really turns this drink into something special. We bought the chartreuse (and calvados) and made The Last Word last night. Amazing! I couldn't really appreciate the complexity of the flavors when it was the second or third drink of the night. The chartreuse adds a spice flavor - nutmeg?- to the maraschino and lime. Incredible combination of flavors! * "Bottoms Up," by Ted Saucier, 1951. * "Jones Complete Barguide," by Stan Jones, 1977. Would anyone be able to post the actual recipes and instructions from both books? The drink is courtesy of Detroit Athletic Club, Detroit. It also says "This cocktail was introduced around here about thirty years ago by Frank Foggerty, who was very well known in vaudeville. He was called the 'Dublin Minstrel' and was a very fine monologue artist." Is it under a different name in "Jones Complete BarGuide"? I don't find it under "Last Word" or "The Last Word" in my copy (1977). "It was in the process of searching though the Jones book recently that the Last Word cocktail was re-discovered by the bartenders at the Zig Zag Cafe, and it has been one of their more popular drinks ever since." As Ted Saucier simply lists "Chartreuse", how do we know he meant green chartreuse and not the yellow type? Cross checked all the receipts indexed to Green Chartreuse in my Jones Complete BarGuide. Nothing involving equal parts Green Chartreuse, gin, lime, and Maraschino. I also skimmed most of the text and didn't see anything promising. I'll check the Yellow Chartreuse and Maraschino receipts; but, there are a lot more of them, and I need to start making dinner. The Jones bar guide is a little oddly organized. All the receipts are organized alphabetically, and then the index is done based on ingredient(s). While there is a lot of introductory text, the recipe section is quite terse. Without a doubt, one of my favorite cocktails. The first time I made one, I took a sip, and thought, hmmm...I'm not sure if I like this. But by the time I got to the bottom of the glass, I couldn't wait to make another. A few weeks ago I found some fresh yuzu at a Japanese market, and substituted that for the lime juice. All I can say is, wow! Took the drink to a whole other level. I haven't read the whole Jones' Complete; but, I went through all the cross indexed Green Chartreuse, Yellow Chartreuse, and Maraschino cocktails last weekend and found no trace of the Last Word or anything similar. I didn't go through all the Gin cocktail; but, that just seems too painful. I get eye strain just thinking about it. There are a few similar drinks; but, nothing that contains all four of the listed ingredients in equal parts. Does anyone have a version of the Jones' Complete that contains it? Might have to drop a note to Mr. Hess and ask if he remembers the incident in question. I asked Robert about this. He said it was a mistake on the website he thought he had corrected. The bartenders at the Zig Zag were looking through Saucier's "Bottom's Up", not the "Jones' Complete BarGuide", when they discovered The Last Word. Whew, I'm glad I asked him before going through the gin recipes in "Jones`..." one by one! Reading through all those 70s era recipes was starting to make me think I really needed a bottle of Galliano for my home bar. A bit like the expression The Darb. I'd forgotten how much I absolutely love these. I'm on my second one. Damn all of you. Every last one of you. The Last Word cocktail offers us a very interesting look into the cocktail revival and the evolution of cocktail culture. And we all played a part! Back in 2004 when Murray Stenson put the Last Word on the menu at Zig Zag, it was an obscure cocktail that practically no one had ever heard about. If you walked into a top cocktail bar other than Zig Zag and asked for a Last Word, the probability is that you would have been met with a blank stare. Then birder53 posted about it, we started talking about it on eGullet and I started talking about it with my bartender friends at Pegu Club, several of whom were either members or read the eG cocktails forum. Right around the same time, Brian Miller (then at Pegu) returned from spending some time with the Zig Zag guys, and this provided an additional vector of interest in the cocktails they had featured in Seattle. Before too long, the Last Word spread among internet cocktailians from the eG Forums, and among NYC cocktailian bartenders and their clients from Pegu Club. With a year or so, everyone knew about it. Riffs such as Phil Ward's "Final Ward" made it onto the featured list at Pegu Club. Roughly three years after this thread started, the Last Word was considered by many to be an "established classic" -- so much so that cocktailians might assume most any cocktail bar worth its salt would know the drink as of 2007. It's a long way from virtually unknown to classic to basis formula for modern classic-style cocktails in three or four years. That's fascinating -- and as the doofus who was busy judging other places based on that lapse, mea culpa. But back to the drink at hand: is anyone else dripping a few drops of Pernod in there now and then?